Global laminated glass market is expected to reach USD 27 billion by 2025 growing at a CAGR of more than 6% between 2017 and 2025. 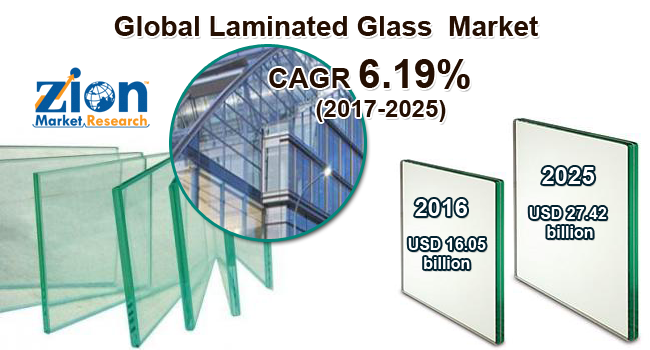 The report covers forecast and analysis for the laminated glass market on a global and regional level. The laminated glass market has been analyzed using Porter’s Five Forces Analysis. The market is segmented on the basis of interlayer type, end user, application, vertical, which in turn is bifurcated on a regional level as well. The report deals with the in-depth quantitative and qualitative analyses of the laminated glass market. Laminated glass is a type of glass that is used for the safety and security purposes. This glass is made by sandwiching a laminated sheet between two layers of glass. The laminated glass has the characteristic that it does not shatter into pieces when it falls or even if a strong external force is applied. Different types of laminated sheets are used and depending on the sheet it is used in several applications. The global laminated glass market was valued at around USD 16 billion in the year 2016 and is expected to reach over USD 27 billion by the end of 2025 growing at a CAGR of more than 6% between 2017 and 2025. Increasing awareness about the benefits of using glasses in the construction has triggered the growth of the laminated glass market. Laminated glasses provide advantages such as safety, energy savings, and security, increased durability, soundproof, and much more. The various end-user industries such as telecom, healthcare, aerospace, and electronics are investing in the laminated glasses owing to the increased safety and security provided by the glass. The laminated glasses are used widely owing to its strength, impact resistance, sound reduction, hurricane and earthquake resistance, bullet resistance, etc. The demand for the laminated glass is exponentially growing from the construction industry. In addition, there is also an increasing demand for the laminated glasses from the automotive sector. However, the laminated glass market is expected to face some challenges such as high capital investment and volatile prices of the raw materials. Polyvinyl butyral (PVB) segment registered the highest market share of over 34.20% in 2016 and it is also expected to grow at a higher CAGR of around 6.0%. over the forecast period. The PVB laminated glass has good tenacity performance due to which the PVB absorbs a large amount of force and disperses it evenly. Thus breaking a laminated glass is a difficult task. The PVB laminated glass also has the property of viscoelasticity thus reducing the sound acoustic insulation. The non-residential segment accounted for the largest market share of around 65% in 2016. This is mainly driven by growth in the usage of laminated glass in the construction industry. The office building segment, a sub-segment of non-residential segment contributed the highest market share in 2016, owing to rise in the industrialization globally. The use of laminated glass in construction is expensive and deploys high maintenance, but at the same time, it also has several benefits. It provides unique features like safety, sound reduction, U.V. control, durability, design versatility, ease of installation, and many more. By application, windows, doors, and skylights segment contributed the maximum market share of over 39.50% in 2016. Windows, doors and skylights segment is expected to grow with the highest CAGR of 6.71% over the forecasted period. As ordinary glass windows are brittle in nature they can break into sharp pieces causing injuries. This problem is resolved by the laminated glass as the interlayers within the laminated glass helps in absorbing the energy thus eliminating the chances of injuries. Laminated glasses when used in the windows, doors, and skylights give a high rate of security as it can resist intrusion and it is impossible to cut through the thick PVB layers. Thus, there is an increased demand for the laminated glasses in the windows, doors, and skylights segment. Apart from windows, doors, and skylights, open-edged railings and structural glass flooring are also expected to gain traction over the forecast period. Building & construction segment dominated the laminated glass market in 2016 by contributing a market share of 36.27%. The automotive segment is projected to grow at the highest CAGR of 6.57% over the forecast period. As laminated glass provides a high grade of protection as compared to normal glass, the application of laminated glass in automotive sectors is gaining traction. Increasing trend of the sunroofs and large windshields in the automobiles fuels the demand of the laminated glass in the global market. The significant growth of the automotive industry expects to boost the demand for laminated glass over the forecast period. Asia Pacific is expected to grow at the highest CAGR of 6.85% over the forecast period. Heavy investment by international companies in the Asia Pacific region owing to cheap labor has lead to rapid industrialization. Moreover, the growing population in countries like India, China, and other Asian countries has resulted in increased demand for new constructions which has, in turn, increased the demand for the laminated glass in several applications and sectors. North America held the highest market share of 34.73% in 2016 and is growing with a steady CAGR over the forecast period. The report includes detailed profiles of the prominent market players that are trending in the market. The lists of the players that are compiled in the report are Aeon Industries Corporation Ltd., AJJ Glass Ltd., Asahi Glass Co. Ltd., Cardinal Glass Industries Inc., Central Glass Co. Ltd., China Luoyang Float Glass Group Co. Ltd., China Specialty Glass AG, CSG Holding Co., Ltd., Flat Glass Group Co. Ltd., Fuso Glass India Pvt. Ltd., and Fuyao Glass Industry Group Co. Ltd., among others. The prominent market players maintain the competitive edge in the global market by making investments in the mergers and acquisitions and by increasing their product portfolio. In February 2017, Nippon Sheet Glass Co., Ltd. announced for significant technology and manufacturing upgrades at its automotive glass plant in Versailles, Kentucky, U.S. The company is using the modern Advanced Press Bend (APB) process for laminated windshields which is being developed for manufacturing the complex-shaped windshields with a tighter tolerance.